Gov. 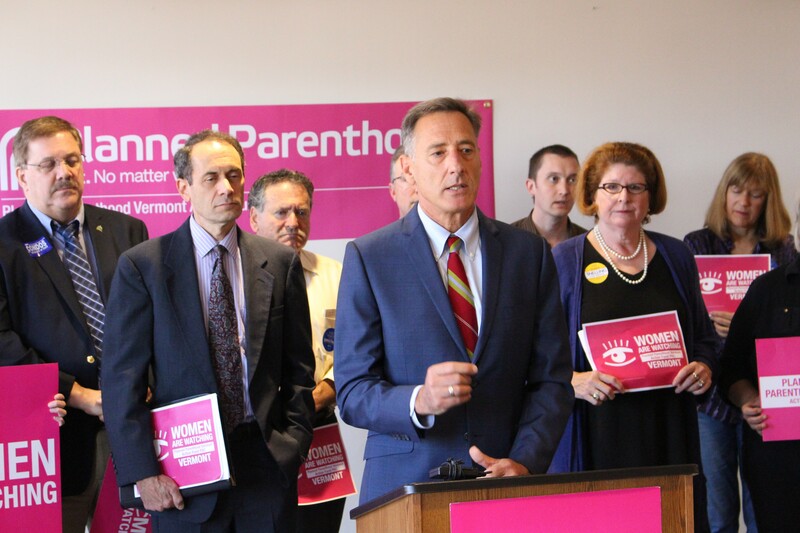 Peter Shumlin receiving Planned Parenthood of Northern New England's endorsement last Friday. Updated Thursday, October 2, at 7:31 a.m.
Two years ago, Gov. Peter Shumlin spent just $285,000 on television advertising throughout his campaign against former state senator Randy Brock — all of it in the last two and a half weeks of the race. But according to a new report filed Wednesday, Shumlin has already spent more than $215,000 on TV ads this time around — and he still has a month to go before Election Day. Given the conventional wisdom that it's unwise to pull political ads once you start running them, the governor is likely to spend hundreds of thousands more in the remaining five weeks of the campaign. According to his latest filing with the secretary of state's office, Shumlin raised nearly $101,000 last month and spent nearly $235,000. Throughout his campaign for a third term, the East Montpelier Democrat has raised $713,000; he currently has $1.03 million in his campaign account. While Shumlin continued to best his opponents in the fundraising race, Republican rival Scott Milne had a relatively impressive month. Prior to September, the Pomfret developer and travel agency president had principally relied upon a $25,000 personal loan and contributions from his own family and that of friend and business partner David Boies III. But last month, according to his latest filing, Milne collected more than $81,000 — a quarter of which came from 348 people who contributed $100 or less. Milne also took $2,000 from Boies’ son, David Boies IV, and $9,900 from his own son, Keith Milne, who has been volunteering on his father’s campaign. Milne has now raised a total of nearly $137,000 this campaign season, $95,000 of which he has spent. Last month, he spent $33,000. His largest expenses included payroll, lawn signs, consulting services, access to the Vermont Republican Party voter database and $3,814 to produce a television ad. Another gubernatorial rival, Libertarian Dan Feliciano, raised little money last month. According to his filing, he took in just $3,528 in September, bringing his campaign total to $17,000. Feliciano spent a mere $930. As usual, Shumlin raised the vast majority of his money from big-dollar donors, many of whom contributed the $2,000 maximum for those not related to a candidate (political action committees can donate up to $6,000). Just $765 of his cash came from 15 people who contributed $100 or less. At least one major donor skirted Vermont's contribution limits by sending checks from five LLCs he controls. Pritam Singh, a real estate developer who splits his time between South Woodstock and Key West, contributed a total of $12,000 to Shumlin's campaign last month. The governor also took money from a number of corporations, unions and PACs. Those contributing $2,000 or more last month include: AFL-CIO ($6,000), AGRI-MARK ($2,000), American Federation of Teachers ($6,000), Cerner Corporation ($2,000), General Motors ($2,000), John Deere ($5,000), NRG Energy ($6,000) and the National Education Association ($6,000). In the race for lieutenant governor, incumbent Republican Phil Scott collected more than $40,000 last month, bringing his campaign total to $202,000. That’s a significant number because his opponent, Progressive/Democrat Dean Corren, qualified for up to $200,000 in public financing in June. At present, Corren still has more cash at his disposal. He spent just more than $22,000 last month — and nearly $52,000 since the start of the campaign — leaving him with $148,00 to burn in the next five weeks. Scott has been spending at a more rapid clip. He doled out $57,000 last month — $50,000 of it on television advertising — and $150,000 since the campaign began. That leaves him with $95,000 in the bank. But unlike Corren, who is barred from raising any more money as a condition of public financing, Scott can keep collecting checks. On Wednesday night, for example, he was scheduled to hold a fundraiser in Burlington hosted by several members of former governor Jim Douglas’ administration, among others. Scott’s biggest contributors last month included Peckham Industries ($1,000), Anheuser Busch ($1,000), Campaign Research Center ($3,000), the Wayside Restaurant ($1,000), Vermont Auto Dealers Association ($2,000), Vision to Action Vermont ($1,000) and the Vermont Fuel Dealers Association ($1,000).